As stated in their mission statement, the US Food and Drug Administration (FDA) is responsible for protecting public health by assuring the safety and efficacy of drugs, biological products, medical devices, food, and more. It’s a tall order, no doubt, but the FDA makes many glaring omissions or, some might say, blatant oversights that put the public’s health at risk. Yet, the public is quite understanding and tolerant of the FDA’s mistakes and industry-friendly positions. There is no major public uproar or demand for a (much-needed) overall of the agency. But it is hard to defend an agency that continually acts against the best interests of the public they’re entrusted to defend. Now, due to the efforts of a professor and his students at the Arthur L. Carter Institute of Journalism at New York University, we have yet another example of the FDA failing to warn Americans, in this case about grave concerns due to falsifications in published data. The FDA reviews several hundred clinical trial locations that conduct research on human participants each year in order to be sure they’re engaging in good clinical practice. But what happens when they find evidence of questionable procedures or practices? Now, if a trial had been deemed OAI by the FDA, you might assume that you’d see evidence of that when reading the results of studies based on said data. But that would be a liberal assumption. Researchers conducted a review of FDA inspection reports between 1998 and 2013. They found 60 clinical trials that had been classified as OAI, and these trials had been used for data in 78 published articles. Out of those 78 studies, only three included mentions of the violations found by the FDA! And we’re not talking about small, innocent mistakes. The violations included fraud, incompetence, and misconduct. This means that anyone browsing a medical journal might be making decisions based on fraudulent published studies. Widespread Scientific Fraud, Limb Amputations… Even a Related Homicide Case! In all, the study found about 2 percent of the close to 650 FDA inspections were classified as OAI. Among the violations was a trial in which patients were treated with stem cells to treat poor blood flow in a leg. The trial reported that all patients reported improvement in their limbs… but one person had to have a foot amputated two weeks after the treatment. In another case, the FDA said “systematic and widespread scientific fraud” made a trial of the blood-thinning drug rivaroxaban unreliable. But no mention of this fraud is made in the journals that published its findings. The FDA devotes an entire section of its website to transparency and says they’re engaged in an “agency-wide effort to open the doors of the agency.” Yet, most of the documents obtained by students for the featured study were heavily redacted. “Reading the FDA’s inspection files feels almost like watching a highlights reel from a Scientists Gone Wild video. It’s a seemingly endless stream of lurid vignettes—each of which catches a medical researcher in an unguarded moment, succumbing to the temptation to do things he knows he really shouldn’t be doing. Faked X-ray reports. Forged retinal scans. Phony lab tests. Secretly amputated limbs. All done in the name of science when researchers thought that nobody was watching. That misconduct happens isn’t shocking. What is: When the FDA finds scientific fraud or misconduct, the agency doesn’t notify the public, the medical establishment, or even the scientific community that the results of a medical experiment are not to be trusted. On the contrary. For more than a decade, the FDA has shown a pattern of burying the details of misconduct. As a result, nobody ever finds out which data is bogus, which experiments are tainted, and which drugs might be on the market under false pretenses. The FDA has repeatedly hidden evidence of scientific fraud not just from the public, but also from its most trusted scientific advisers, even as they were deciding whether or not a new drug should be allowed on the market. When the 1958 Food Additives Amendment was enacted, the exclusion of GRAS items from the formal FDA approval process for food additives was meant to apply to common food ingredients such as vinegar, i.e. items known through their historical use as being safe. Nowadays, however, countless manufactured ingredients end up slipping through this loophole. The FDA has created a voluntary program that asks food companies to submit their safety assessments for FDA review. If the agency cannot find any major problems with the company’s argument for GRAS status, a “no questions” letter is sent to the company. However, if questions about safety are raised by FDA scientists, the company can simply withdraw its voluntary submission, and go on using the chemical as if nothing has happened. How Independent Are Vaccine Supporters? 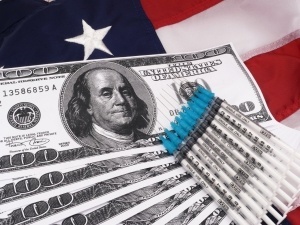 The pro-vaccine group Every Child by Two has also received money from the vaccine industry, as has Dr. Paul Offit, who is one of the most outspoken defenders of vaccine safety. Dr. Offit received a reported $350,000 grant from Merck to develop a rotavirus vaccine, and has served on the scientific advisory board for Merck. He received another estimated $6 million when Children’s Hospital of Philadelphia (CHOP) sold the patent for the RotaTeq vaccine he developed. He was also on the CDC advisory board that approved the addition of a rotavirus vaccine to the US National Immunization Program (NIP) in 1998—a decision that paid off handsomely. Merck is the same company that created a fake “peer-reviewed” journal called The Australasian Journal of Bone and Joint Medicine to promote pro-Vioxx articles. Merck even had a hit list of doctors who had to be “neutralized” or discredited because they had criticized the painkiller Vioxx. Those who made it onto Merck’s “hit list” said they experienced instances of intimidation, including suggestions that Merck would stop funding the institution or interfere with academic appointments. This clearly gets in the way of academic freedom, researchers’ ability to accurately report their findings, and doctors’ ability to speak out against a drug they believe is harmful. But then that is what Merck was after. Adding to the issue, of course, is that this is probably not an isolated occurrence. Drug companies could be keeping any number of lists of people who are interfering with their ability to sell and make profits, and my guess is that they are at work “neutralizing” those people as we speak. In fact, I would bet on it. The US is one of them (New Zealand is the other). What is DTC advertising? It’s that barrage of ads you see on TV and in magazines and newspapers, or on the radio and Internet. They’re ads telling you to run right out and ask your doctor if this or that pill would be right for you. Some drug companies have even taken to advertising highly specialized medical devices, like heart stents. It’s a marketing bonanza that’s turned America into a medicated mass of people who’ve been brain-washed into thinking that taking pills will make everything better―even for ailments you might not have.